At Asperity Employee Benefits, we've always been obsessed by product and service. When I founded Asperity in 2007, I saw an industry that wasn't servicing clients well. At one extreme there were expensive consultants and brokers that seemed to make a lot of money from making the world complex. At the other extreme were cheap or free employee discount services that didn't deliver anything of value to employers. At neither end was there someone helping HR, Reward and Benefits specialists who were trying to make a real impact on their employees and for their companies. Asperity was founded to bridge that gap. Our hunch was that if employee discounts were done properly, with honesty, transparency, great technology and fantastic service, then they could deliver and anchor an employee benefits service and provide high engagement and strategic value for our clients. Fortunately that hunch proved out, and there are now almost 900 leading employers across the UK, Australia and the U.S. who have bought the world's best employee benefit service. Worldwide we now handle over £1m ($1.7m AUD / $1.6m USD) of employee shopping every single day. We'll end this year saving employees over £3m ($5.1m AUD / $4.8m USD) each month. And we deliver for our clients, achieving 99.5% client retention this year. A thirst and hunger for making things better, constantly driving innovation is absolutely in our DNA. We have a fantastic roadmap and pipeline of developments, product enhancements and improvements for you - all designed to deliver you stronger, better and more visible return on investment. This week, we're announcing highlights of our Reward Gateway 2014 roadmap and the transformation of our business into the leading provider of integrated employee engagement technology. We'll never forget our roots in employee discounts though - they are still the single most effective benefit for getting employees back to your service every day and week. So in our core product we've announced new discount and benefit integrations, revolutionary new location-dependent mobile offers and a truly beautiful new approach to management information with our new Reward Gateway MIS app for the iPad. And with the announcement of those changes comes our news. 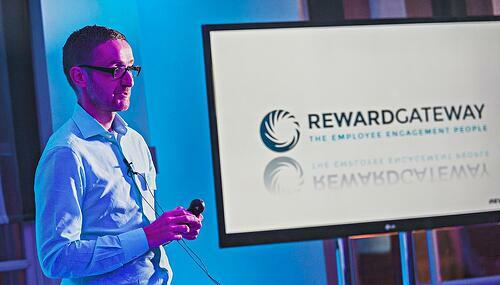 Reward Gateway, our product, has always been the core of what we do, the heart of our service and proposition. And we've decided that from the end of this month, Reward Gateway will become the new name for Asperity. We're really excited about this change, we've been planning it for some time and everyone here is tremendously excited about what we've been calling "our new beginning". It's given us a chance to shake everything up and refocus on what clients want us to do and what we love doing - driving engagement. To celebrate and explain our new launch, we've put together a series of very short videos. They will explain everything we're doing and what you can expect from us in the future. 150 people on 3 continents work tirelessly to make Asperity what it is and we would love to work with you and for you in the future.